No documents a fascinating event from the late 20th century. In 1970, Salvador Allende Gossens became the world’s first freely elected Marxist leader, when he assumed the presidency of Chile. Allende proceeded to do things such as nationalize the Chilean copper industry, raise the minimum wage, subsidize the arts, and launch anti-poverty programs—all of which were anathema to investors, international bankers, and Chile’s upper class. Three years later he was toppled by a military junta headed by General Augusto Pinochet, possibly with the direct aid of the CIA and definitely with indirect aid. (There is little doubt that Henry Kissinger had conversations about overthrowing Allende.) Pinochet’s rule was among the most brutal in the Western hemisphere, and his death in 2006 was probably all that stood between him and convictions for crimes against humanity. Pinochet was, however, long out of power by the time of his death, thanks to the campaign dramatized in No. In 1988, Pinochet’s rule ended through an unlikely means—he lost a plebiscite that would have approved a new eight-year term for his regime. For those unfamiliar with plebiscites, it is a political maneuver invented in ancient Rome in which citizens are asked to vote yes or no on a single issue. Its intent is largely to give the gloss of public approval for actions favored by those currently in power; put another way, it’s exceedingly rare to lose a plebiscite as those in power control the question and voting procedures. In Chile’s case, Pinochet opponents had just 27 days to make 15-minute-per day TV pitches for the “No” campaign. That’s it—just 6 hours and 45 minutes of total campaign time, or Pinochet stays in power. All of this makes for a potentially fascinating story, though director Larraín falls considerably short of making the film as compelling as it should be. This film was nominated for a Best Foreign Language Oscar, but that’s based on the subject matter, not the direction or performances. 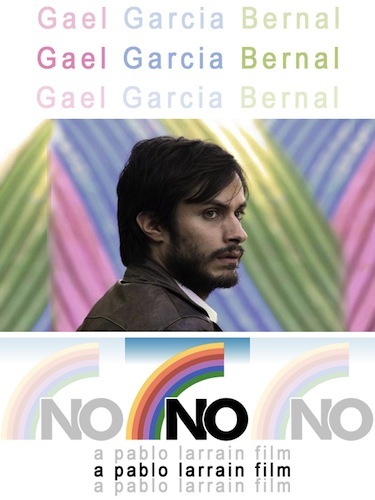 Larraín seeks to add verisimilitude by filming No as if it’s a documentary. He bathed the stock with light sepia undercoating to give it an “old” feel, and used hand-held cameras, lens flares, and episodic storytelling to give the illusion of being in the moment. Often, though, the narrative feels disjointed, story lines turn down dead-end alleys, and the action feels more like a bad dress rehearsal than a vote on a nation’s future. Bernal has limited range as an actor and in No he doesn’t do much more than lumber about with puppy-dog eyes and a hang-down face. We suspect that Saaverda is a huckster for whom freedom is just another product to flog, but Bernal doesn’t do more than make us think he’s just an actor walking through a part. He’s not sharp enough to be conniving, not articulate enough to be ideological, or proactive enough to make us suspect evil. He is, simply, on screen, and about half the time we wonder why. The superior actor Alfredo Castro does his best to engage Bernal, but his part is too underwritten to pull it off. I’ve long been a fan of Richard Russo’s novels. Few other writers better capture the rhythms of working-class life; fewer still have his grasp on blue-collar dreams imagined and deflated. Elsewhere tells us what we’ve long suspected—he fashioned his imaginative worlds from a time-honored source: his own experience. Russo’s hometown of Gloversville, New York, is the real-life template for fictional towns such as Mohawk, Empire Falls, and Thomaston. For those who don’t know Gloversville, it’s a town of around 15,000 located on the Mohawk River/Erie Canal in Fulton County, New York, northwest of Schenectady. As its name suggests, it was once the dress-glove manufacturing capital of the nation. Given that almost no one wears dress gloves any more, you can predict what kind of town Gloversville is these days. As Russo relates, it was well on its way to becoming a seedy postindustrial town by the time he was born in 1949. How many kids question their lives? Young “Rick” Russo thought little of Gloversville’s shabby exterior until he reached his late teens. Nor did he ask too many questions about why his parents split, why he and his mother lived with relatives, or why his mother was so combative and odd. Those who’ve seen the movie Nobody’s Fool—adapted from Russo’s 1993 novel--might recall a scene in which construction worker Sully (Paul Newman) reveals to his college professor son that his mother was not just “difficult,” rather clinically unbalanced. That’s autobiographical. By the time Jean’s mental illness was revealed, Jean had become a permanent part of her son’s life, as much as he often wished she was not. She was there when he was in Arizona, there when he got a teaching job at Southern Illinois University, there when he moved on to Colby College (Maine), there when he married, and there when he chucked teaching to become a fulltime novelist. She always insisted on living independently, though no place was ever good enough and oblivious of the strain she placed on Rick’s family and finances. We can easily see what it took Rick decades to admit: Jean did just have bad “nerves;” she was mentally ill—early onset dementia as it turned out. And Gloversville had a dual meaning for her—a place she said she wished to escape, but also the familiar refuge to which she periodically fled when her demons became too powerful to fight in unfamiliar places. 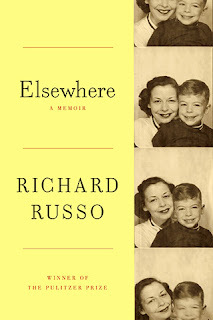 His mother’s shifting mental states, the duality of what Gloversville meant to her, and his own journey from working-class lad to working writer are among the many ironic meanings of the memoir title Elsewhere. Another is Russo’s own relationship to Gloversville, a place now so far past its prime that he describes his main drag as one where a person could fire an automatic weapon without injuring anyone. He feels blessed to have escaped, yet like his mother, he constantly returns there in his fiction. Make sure he hears you--NO! on Syria. Alexander Pope said it best back in 1709: “Fools rush in where angels fear to tread.” The subject is Syria and President Barack Bush, sorry, Obama is the fool. He has been exploring ways to convert humanitarian aid for Syrian rebels into military aid to help topple Bashar Assad’s regime and replace it with one more amenable to rapprochement with the United States. Ousting Assad is doable, but the second part is fantasy from a president who seems desperate for some sort of foreign policy triumph to ameliorate a string of domestic failures. Unless wiser heads—though I’ll settle for crazed GOP deficit freaks—stop him, Barack Obama runs the risk of going down in the history books as a worse president than George W. Bush. If you think Iraq was/is bad, wait until you get a whiff of the Syrian stench. And wait until tax payers start footing the bill. The push for Syrian intervention is every bit as bogus as the march into the Iraqi quagmire. Remember “weapons of mass destruction?” (Of course you don’t; there weren’t any!) Now we hear charges that Assad may have used sarin gas against the rebels. There’s no tangible proof of this at present—“yellow cake” anyone? But even if Assad has committed such a crime against humanity, Syria simply is not our fight. Let’s call Syria what it really is: a relic from the Cold War that is today a repository of Al Qaeda terrorists that are more of a threat to the United States than Assad has ever been. Why would the U.S. even consider interjecting itself into the Syrian civil war—to avenge the Cold War era in which the Assad family aligned itself with the Soviet Union? Ancient history! Are thousands of Syrian civilians suffering? Yes. Is that terrible? Of course it is. Can the United States stop this? No, no, no—a thousand times no. We really made things better for Iraqis once Saddam Hussein fell from power, didn’t we? (Forget the nonsense you hear from the Pentagon, if Iraqis had the power to turn back the clock and restore Saddam as an alternative to today’s anarchy, they’d do so in the wink of en eye.) There is but one credible coalition that could intervene in Syria and that’s one sanctioned by the United Nations and led by Arab states. And Geneva-based U.N. authorities would be the ones to try Assad for gassing Syrians, not the U.S. court of public opinion. In fact, anything with a U.S. thumbprint on it will simply further Syria’s agony. One wonders if John Kerry and the State Department are blind or just stupid. (Follow link for an earlier post on this.) It’s as if the State Department—first under Bush, now under Obama—is hell-bent on making Iran the region’s Islamic superpower. First, the U.S. under Bush manufactures a reason to take down Iraq, Iran’s biggest enemy in the region. Then we glibly praise Arab Spring uprisings as wellsprings of democracy, when in fact they are power grabs by theocratic Sunni oligarchies. Iraq burns, Egypt wobbles under Muslim Brotherhood fanatics, Hamas exports terror from Palestine and the Gaza Strip, and Yemen and Libya have become training grounds for Al Qaeda. In each case the United States has tried to play power broker, and in each case it has made the situation worse, not better. Moreover, in each case the only nation that has come out stronger in geopolitical terms is Iran. I suppose one might argue the U.S. is helping create a Sunni countervailing force to Shi’ite Iran; if so, that’s the equivalent of a fool borrowing money to bet against the house in roulette. Thus far, we’d have to say such a strategy has failed spectacularly. (Even the Sunnis and Shi’ites seem to agree that the U.S. is the Great Satan.) The biggest loser of all, potentially, is Israel, which often bears the blunt of the blame for U.S. policies. It certainly suffers from the lack of strong nation states other than Iran—even those that don’t recognize its right to exist. Israel was better off with Saddam, Assad, and Mubarak in power. Collapsed states are so many Gazas and Lebanons—lawless regions where no authority whatsoever can check the movements of hate groups such as Hezbollah or Al Qaeda. Even if you don’t buy my analysis or logic to this point, here’s another reason to stay clear of Syria: there are no credible U.S. allies there. Check out Ben Hubbard’s analysis for the New York Times. As he breaks it down, any aid the U.S. sends is likely to end up in Al Qaeda hands or those of some other extremist group. There is, simply, a lack of “moderates” in the battle. Hubbard didn’t put it this way, but I will; the United States would ultimately end up arming the equivalent of the Taliban—just as it did in Afghanistan. Syria is a political tragedy and a human rights nightmare. One can but weep for those millions of Syrians whose politics don’t extend beyond wanting the suffering to end. Alas, those who seek to impose a settlement are amoral—the tyrant Assad and the extremists who want to wrest power from him, exploit the populace on their own terms, and use Syria to export mayhem elsewhere. There are, in simplest terms, no white hats in Syria, and the stupidest thing the U.S. could do is to try to play sheriff. 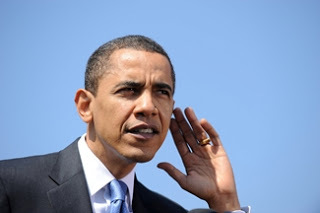 Make sure you tell your representatives that you think Obama is a fool treading where angels dare not. Let them know they will lose your vote and campaign contributions if they don’t do their best to corral him. And be true to your word if they don’t.